Sunday’s game was a 1:35 start and I got up at 10:20, had breakfast at the nearby bagel joint for the third straight day, and left Mark’s place at 11:40. 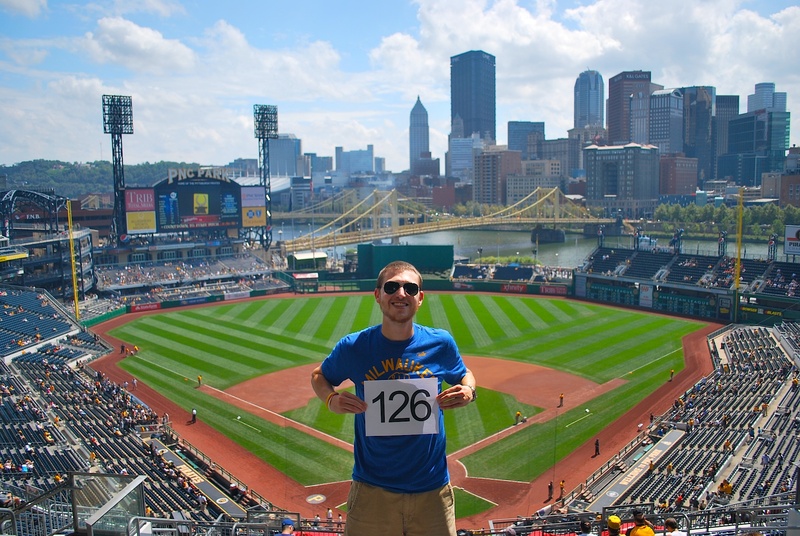 I was parked by 12:15 and outside PNC Park shortly thereafter. 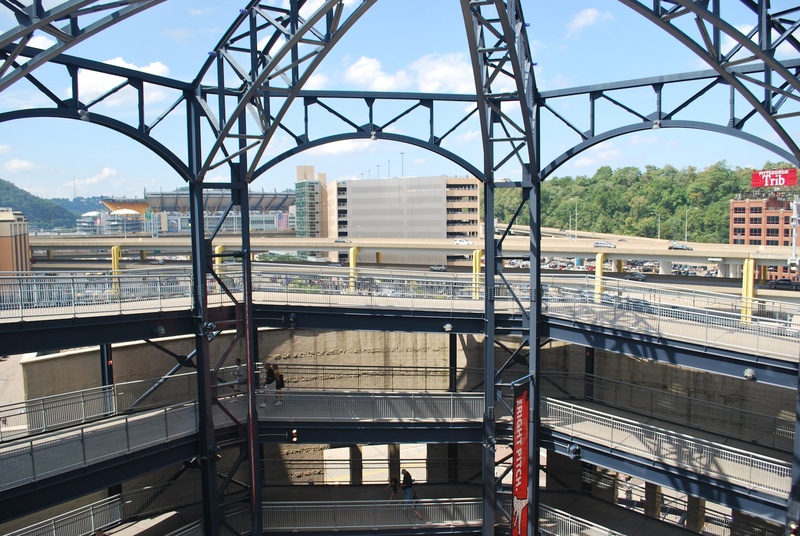 They close the Roberto Clemente Bridge to traffic and the section of Federal Street that runs along PNC park just north of the bridge. 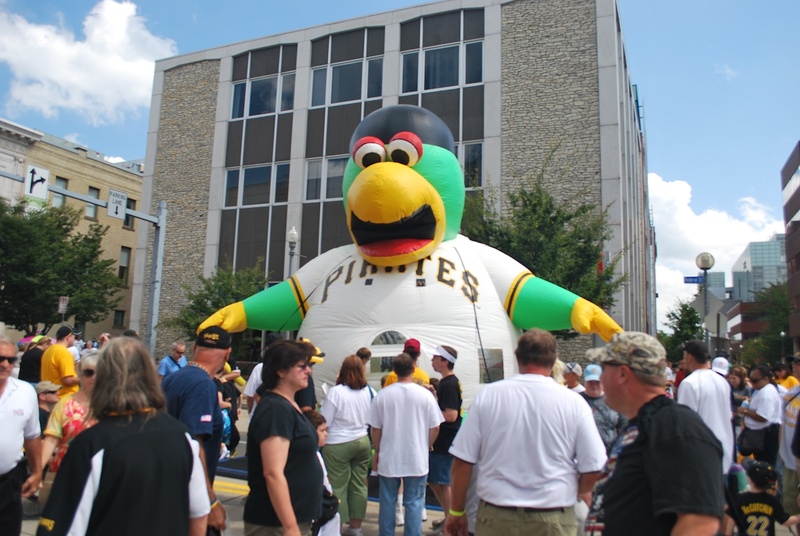 A giant Pirate Parrot bouncy house was on Federal Street. I wanted to give it a try but I figured that would be looked down upon. I picked up my ticket from will call and headed to the upper deck once I entered the park. 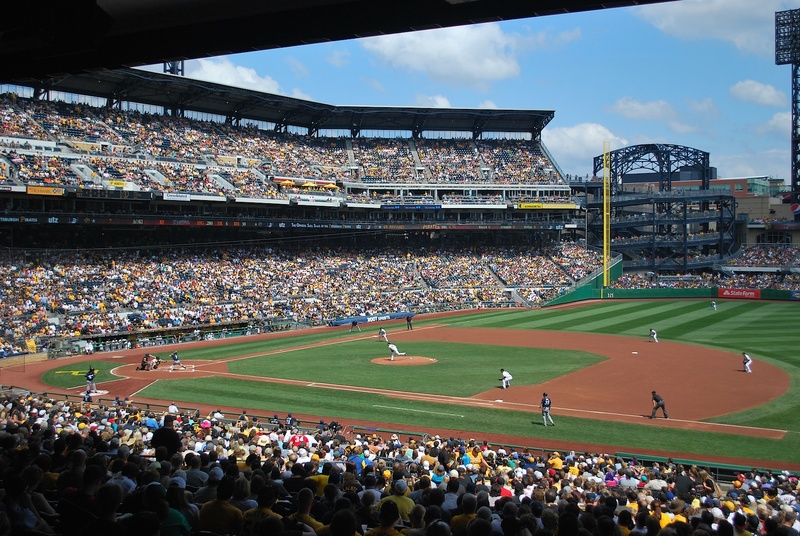 Game photo number 126 speaks for itself as to why PNC Park is one of my favorites. You can’t beat that view. Thanks to Brian who listened to my adjustment suggestions and took a great picture! I took a couple of pictures of the home plate entrance from the upper deck. 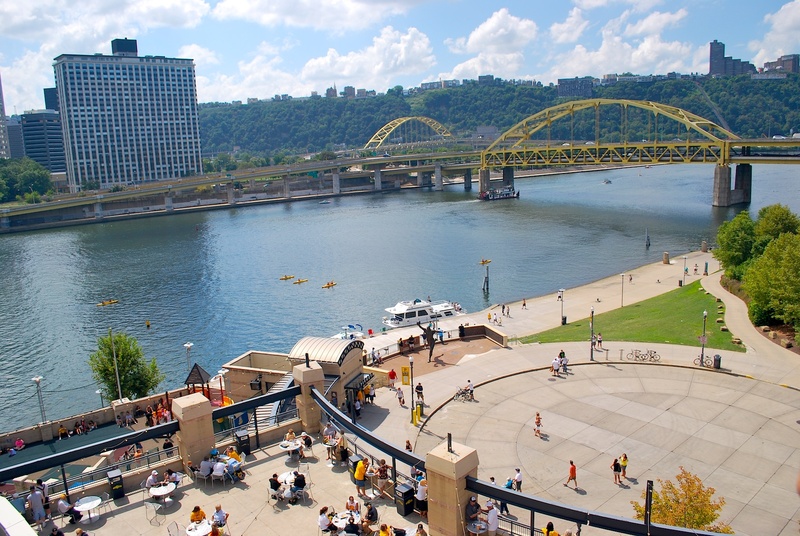 The first one is looking down towards the field level and the second shows the proximity of PNC park to Heinz field, where the Steelers play. I walked around to the right field corner and got an aerial view of the Bill Mazeroski statue that I discussed in Saturday’s post. I went down to the field level, got an iced tea and a hot dog and went to my seat. I had the exact same seat for all three games; section 108, row GG, seat 1. I’m really glad I wasn’t on the other side of the aisle and in section 107. 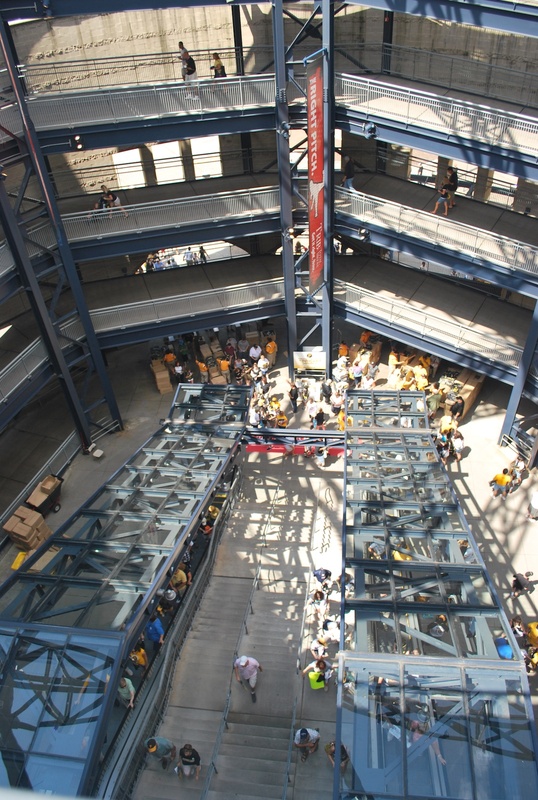 Since the sections are so deep at PNC Park there are always people going up and down the aisles. The usher tried to keep people from going down during at-bats but he could only do so much. The first pitch was thrown to Aoki and the game got underway. Since I was in the shade I thought it was an absolute perfect day to be at a ballgame. In the bottom of the 1st inning Dan Potash of Root Sports Pittsburgh stopped by to do an interview for the Pirates broadcast. Someone had tweeted at Root Sports and told them they should interview me. I also stopped by a camera guy on Friday and reiterated that sentiment. I haven’t seen the interview yet but I think it went well. I was reluctant to let my 1,500+ pitch streak end but I think it was worth it. I got instant feedback on Twitter from Pirates fans wishing me luck and thanking me for raising awareness for Be The Match. I should be able to get the video in the next couple of days. Thank you Ryan for tweeting at Root Sports, and thank you Root Sports for doing the interview! 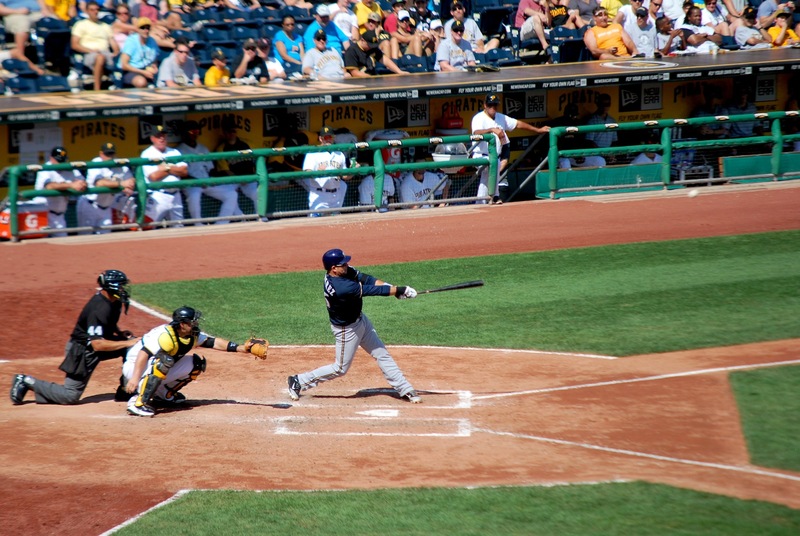 The game was scoreless as the Brewers got their turn at bat in the top of the 4th inning. Braun and Ramirez went down quickly and the Pirates starter only needed four pitches total to retire both of them. 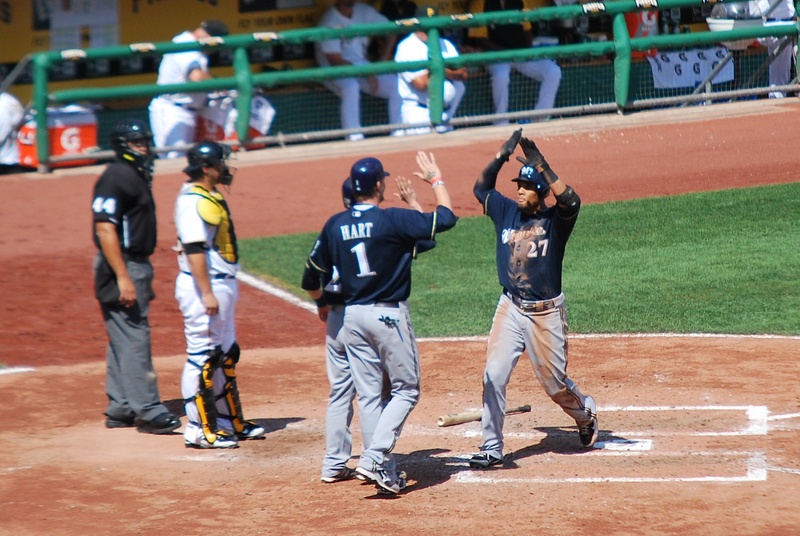 Hart and Lucroy singled and Carlos Gomez stepped in to try and give the Brewers the lead. Bang! The first pitch he saw was deposited into the bleachers in left field. Brewers lead 3-0. Now this is when my day got a little interesting. I looked at my twitter timeline as I do at various points throughout the game. Well, I’ll just include the back and forth between Tom Haudricourt, the writer for the Milwaukee Journal Sentinal, and myself. Some background; there’s an ongoing joke between the announcers and sportswriters that the PNC press box is so high that they need oxygen up there. 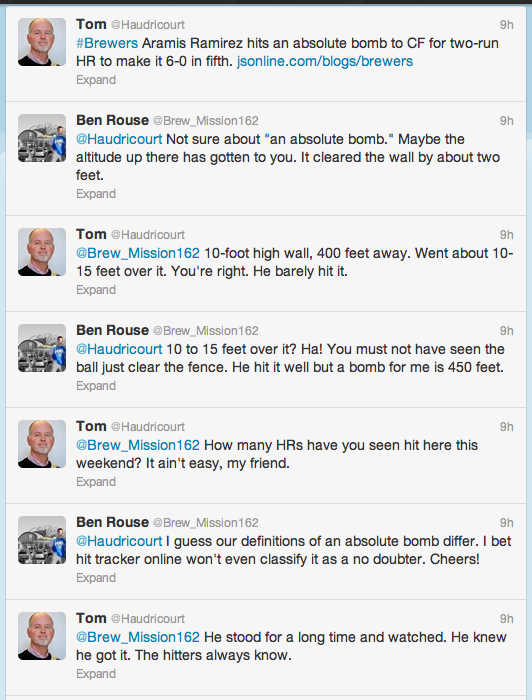 I’m not disputing that a 411 foot home run (as hit tracker online measured it as) is well hit. But an absolute bomb? I think that description should be reserved for ABSOLUTE BOMBS. 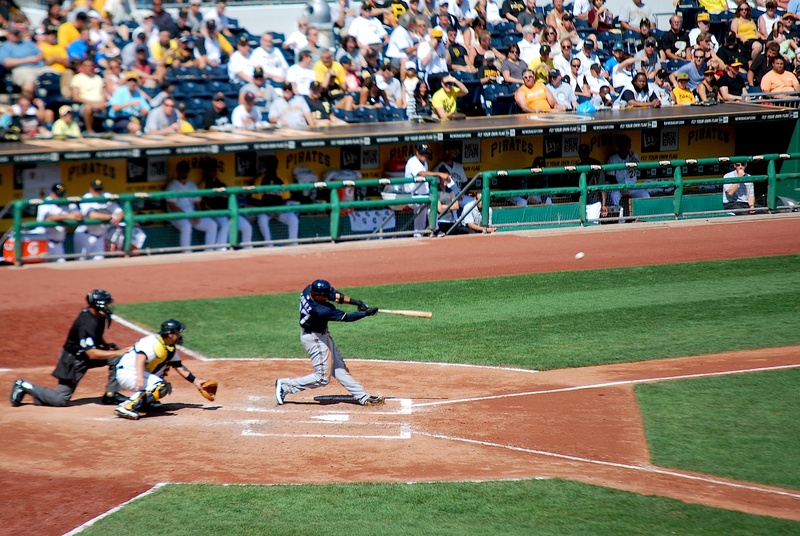 For example; Prince Fielders’ 472 foot home run that bounced into the Allegheny in 2006, or the countless other 440 foot home runs that are hit every season. 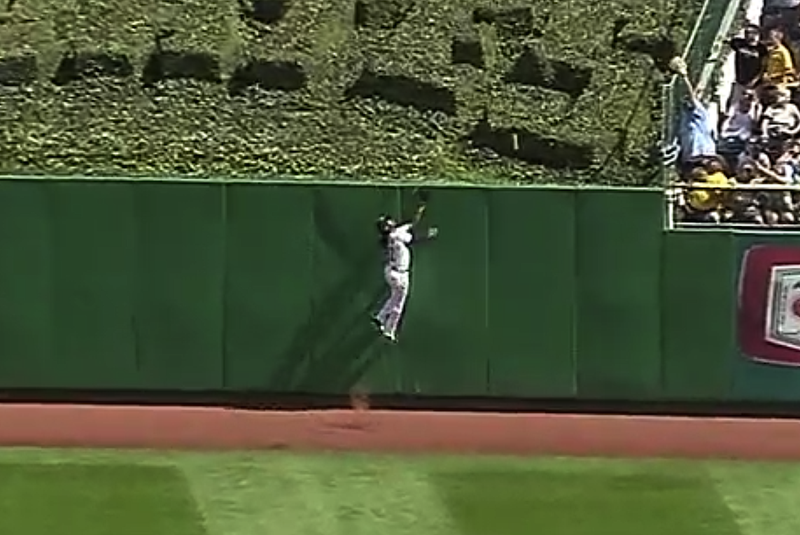 Here’s a screen shot of McCutchen going up the wall, because he almost had a chance to rob it. The ball is below the “S” in “Pirates” that was sculpted into the bushes. Full disclosure: A tweet of mine isn’t included in that timeline stream above. Someone chimed in and said they agreed with Tom and he replied saying “Thank you, sir! I don’t get it, either. Some people like to argue just to argue.” I replied with “Not arguing to argue. Wow. I had said it jokingly, your ignorance escalated it. I won’t question anything of yours again.” That’s likely what pushed him over the edge. I probably should’ve have used a different word than ignorance, but I didn’t. Other people have backed me and said that they’ve unfollowed him because of how he reacted to me simply disagreeing with his wording. That’s not what I was after but their support is appreciated. I thought the back and forth was funny. My friends will tell you that I’m opinionated, and I’m guessing Haudricourt is the same way, to the point that he doesn’t want anyone to disagree with him. I honestly didn’t think he would even respond to my tweet, because he had never responded to any of my other tweets towards him (but they also didn’t question his wording). I apologize if I offended Tom or any of his supporters, I think the whole thing got a little out of hand. I included this argument because the second half of the game was spent responding to people on twitter (and not much happened in the game). One person told me to “Grow up. Get a life/job. It was a bomb.” I didn’t like that very much. Arguing about a home run is one thing but telling me to get a life/job is ridiculous. I informed them that I’m fulfilling a dream and that I’m also raising money and awareness for something that saved my life: Be The Match. The Brewers tacked on a run in the 6th when Aoki drove in Jean Segura with a sacrifice fly. 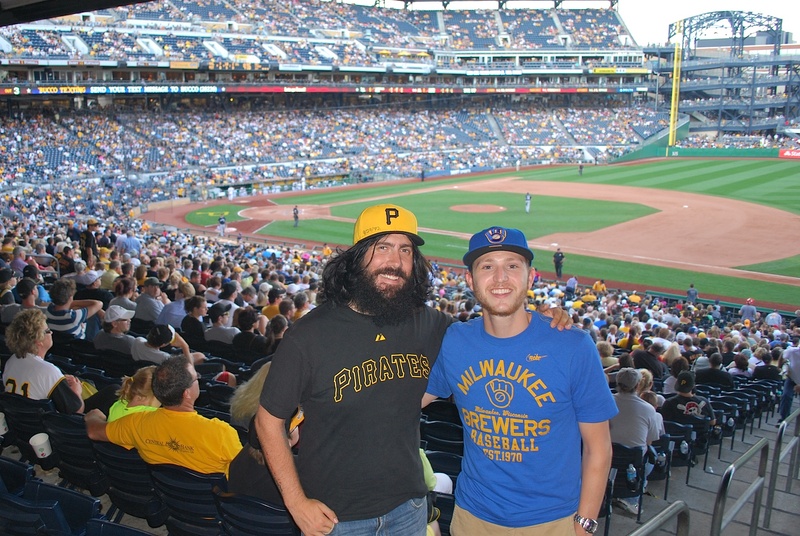 Ben Christensen, who I met at the MLB Fan cave back on May 15th was at the game on Sunday, and he stopped by after the interview to say hi. After people left the game in the 7th he came over and we took in the last two innings together. Between innings I had the usher take a picture of the two Bens. Ben was in the MLB Fan cave until he was eliminated early on (why? I don’t know). He’s a great/funny/cool guy and he has spent the summer traveling around to different ballparks, occasionally catching his team (the Oakland A’s) in action. 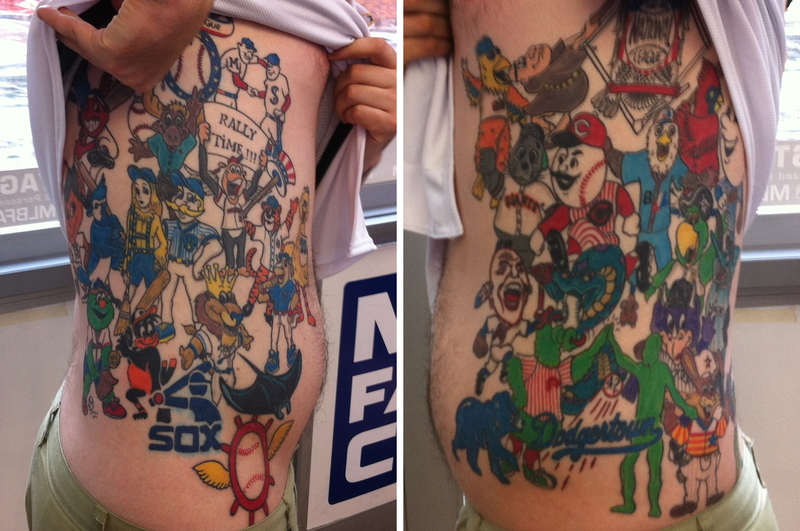 Ben is the one with the tattoos of every MLB team on his torso. Here’s that two part picture I took back at the Fan Cave. 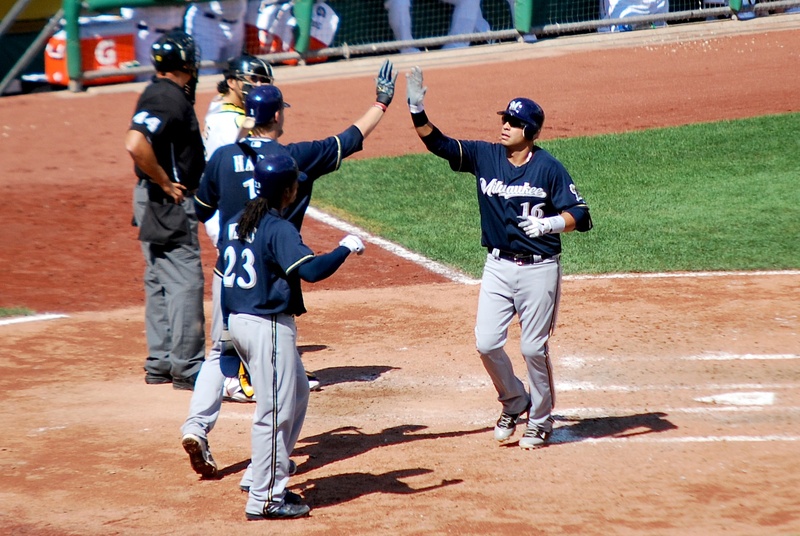 Despite committing three errors in the game the Brewers were able to complete the shutout. Final Score: Brewers 7 – Pirates 0. It was the first road series that the Brewers have won in the second half, taking two out of three vs. the Buccos. After the game I jumped in my car, drove 307 miles, got gas, ate a snickers, and drove the remaining 175 miles to my friend Alex’s place in Chicago. I traversed the 482 miles in 7 hours and 13 minutes, averaging 66.8 MPH (including the stop). The Brewers start a four game series with the Cubs and as of right now there is a 0% chance of rain for the duration of the series. I likely just jinxed myself with that proclamation but I’ll risk it. Go Brewers!